WASHINGTON (AP) — This is one anniversary few feel like celebrating. Two years after economists say the Great Recession ended, the recovery has been the weakest and most lopsided of any since the 1930s. After previous recessions, people in all income groups tended to benefit. This time, ordinary Americans are struggling with job insecurity, too much debt and pay raises that haven’t kept up with prices at the grocery store and gas station. The economy’s meager gains are going mostly to the wealthiest. Workers’ wages and benefits make up 57.5 percent of the economy, an all-time low. Until the mid-2000s, that figure had been remarkably stable — about 64 percent through boom and bust alike. — Unemployment has never been so high — 9.1 percent — this long after any recession since World War II. At the same point after the previous three recessions, unemployment averaged just 6.8 percent. — The average worker’s hourly wages, after accounting for inflation, were 1.6 percent lower in May than a year earlier. Rising gasoline and food prices have devoured any pay raises for most Americans. — The jobs that are being created pay less than the ones that vanished in the recession. Higher-paying jobs in the private sector, the ones that pay roughly $19 to $31 an hour, made up 40 percent of the jobs lost from January 2008 to February 2010 but only 27 percent of the jobs created since then. Hard times have made Americans more dependent than ever on social programs, which accounted for a record 18 percent of personal income in the last three months of 2010 before coming down a bit this year. Almost 45 million Americans are on food stamps, another record. Because the labor market remains so weak, most workers can’t demand bigger raises or look for better jobs. Instead, workers are toughing it out, thankful they have jobs at all. Just 1.7 million workers have quit their job each month this year, down from 2.8 million a month in 2007. The toll of all this shows in consumer confidence, a measure of how good people feel about the economy. According to the Conference Board’s index, it’s at 58.5. Healthy is more like 90. By this point after the past three recessions, it was an average of 87. How gloomy are Americans? A USA Today/Gallup poll eight weeks ago found that 55 percent think the recession continues, even if the experts say it’s been over for two years. That includes the 29 percent who go even further — they say it feels more like a depression. The weakest and most lopsided of any recovery since the 1930s, you say??? WHO WAS PRESIDENT IN THE 1930s? WHICH PARTY DOMINATED BOTH THE HOUSE AND THE SENATE IN THE 1930s? Two UCLA economists say they have figured out why the Great Depression dragged on for almost 15 years, and they blame a suspect previously thought to be beyond reproach: President Franklin D. Roosevelt. After scrutinizing Roosevelt’s record for four years, Harold L. Cole and Lee E. Ohanian conclude in a new study that New Deal policies signed into law 71 years ago thwarted economic recovery for seven long years. In an article in the August issue of the Journal of Political Economy, Ohanian and Cole blame specific anti-competition and pro-labor measures that Roosevelt promoted and signed into law June 16, 1933. And of course all the “experts” the mainstream media love to trot out have all bought hook, line and sinker the notion that capitalism is something to be loathed and feared. So they demand that America pursue asinine government stimulus policies that fail even by the “experts'” own standards, and then these same “experts” proceed to argue that the economy failing to recover somehow is proof that more of the same thing that already failed is necessary. These “experts” whom the mainstream media give a loud microphone to to espouse their socialist views are pathologically incapable of seeing this connection between socialist policies and an economy in the doldrums. Every bit of negative economic news is invariably “unexpected” (liberals favorite adjective to wave a hand at bad economic developments whenever a Democrat president is in charge), because these “experts” cannot separate the inevitable results of their ideology from their terribly failed ideology. There has to be a disconnect, or more commonly, a scapegoat. I think of the Soviet Union, which literally blamed the total failure of their entire political philosophy and the ruinous policies that philosophy entailed by claiming that their agricultural output had been adversely affected due to 72 years of bad weather. And the Soviet Union has gone the way of the Dodo bird for that very reason. Is America under Obama the next Dodo bird to fall apart while we’re assured that everything is fine while some suitable scapegoat bears the blame for every failure that can’t be ignored??? It couldn’t be the fact that socialism is nothing more than state-planned economic failure. It had to be something else, ANYTHING else. The Big Brother from the novel 1984 had Emmanuel Goldstein. The Big Brother who is now occupying our White House has George W. Bush. The answer is twofold: 1) because when you attack the employers, the first thing to go is the employees and 2) because that’s exactly how crony capitalism works. There is a magnificent book entitled, New Deal Or Raw Deal? How FDR’s Economic Legacy Has Damaged America, which should be required reading. Burton Folsom Jr. points out that when FDR structured his many policies and regulations that strangled economic growth, he did so in such a way that favored the big crony capitalist corporations at the expense of the smaller businesses that could no longer compete given the costly regulatory requirements. The smaller businesses were forced out of the market while the big businesses protected themselves with insider deals based on access to and influence with the government that only they could afford. And there is no question whatsoever that – even as FDR employed the class warfare of socialism – the rich got richer while the poor got poorer. Income tax revenues plunged as the wealthy sheltered their wealth from the high tax rates and the poor paid an increasingly high overall percentage of tax revenues via excise taxes. Regulations mandating higher pay for workers priced those workers right out of their jobs. Folsom provides the official data to back it up. 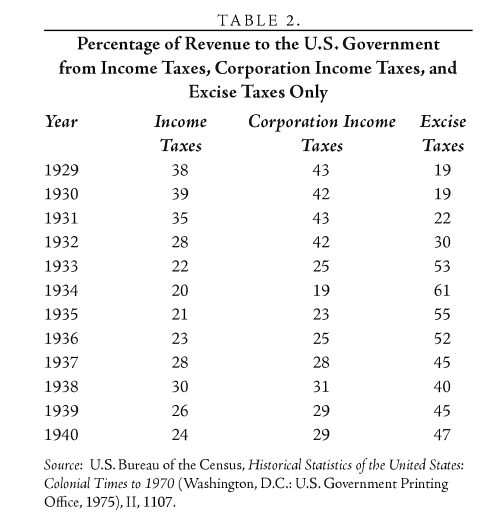 In 1929, prior to FDR demonizing the rich, income taxes accounted for 38% of total revenue collected, and corporate income taxes accounted for 43%. Excise taxes which burdened the poor only counted for 19% of revenues. By 1938, the rich and the corporations had protected themselves from FDR’s demagogic tax policies (but the poor couldn’t), such that the only 24% was collected in income taxes (versus 38%) and only 29% from corporate income taxes (versus 43%). Meanwhile the poor-punishing excise taxes (e.g. gasoline tax) soared from 19% to 47% of the total taxes collected. Meanwhile, when income taxes were kept low, the wealthy invariably paid FAR MORE in the total tax revenue as they put their money out to invest in and expand the economy in pursuit of the profits. And they created millions of jobs in doing so. And guess what? Regulations mandating higher wages are STILL killing jobs now that Obama is doing it. And the exact same mindset is yielding the exact same results ALL OVER AGAIN. Obama has put the fear of God (actually the fear of the Soviet-style STATE) into the wealthy and the corporations. They keep hearing Obama demagogue them, and they keep sheltering their money. And they will CONTINUE to keep doing that until the threat of Obama is gone. Just like they did with FDR. 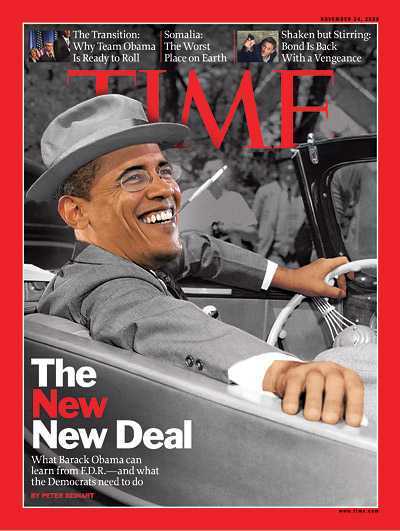 Here we are today, with “the New FDR,” Barack Obama. Who is the top dog on Obama’s economic team? Why lo and behold, it is none other than GE CEO Jeffrey Immelt, crony capitalist extraordinaire whose big corporation has REPEATEDLY benefitted from a cozy insider relationship with big government. And consider how Obama literally took big auto makers GM and Chrysler away from their legitimate shareholders and gave them to big unions. That said, there is also a deliberate and fundamental misunderstanding of fascism by the left. If you read leftists, you come away thinking that somehow “fascism” is the takeover of a state by corporations. But stop and think: Hitler, Himmler, Eichmann, Hess and all the other key Nazis WEREN’T corporate CEOs who took over the state; THEY WERE SOCIALIST POLITICIANS WHO TOOK OVER THE CORPORATIONS. They usurped the corporations and FORCED them to perform THEIR agenda. They either performed the Nazis’ will or they were simply taken away from their rightful owners and nationalized. And to the degree that German crony capitalist corporations helped Hitler in his rise to power, THEY WERE JUST MORE USEFUL IDIOTS. The same sort of takeover of German corporations by socialists is building in America. Take Maxine Waters, a liberal Democrat, as the perfect example. What did she say of the oil companies? THAT’S what Hitler did, too. Hitler got this power through regulations that required corporations to do his bidding, just like Obama has now REPEATEDLY done. And then consider how willing Maxine Waters used “crony capitalism” (which is the essence of developing fascism) to directly personally benefit even as she shaped the banking industry. The Democrat party is the party of socialism. It is the party of Marxism. It is the party of fascism. The Chicago way is a very, very ugly way. And Obama has been in it up to his eyeballs. Chicago is a dirty place filled with dirty politicians – and Obama was perfectly at home with all the dirt. That Chicago corruption extends right into Obama’s home, by way of his wife Michelle. This is a woman who sat on high-paying boards in direct quid-pro-quo consequences of Obama advancing in public office. And in some of those boards, she participated in the worst kind of hospital patient-dumping. Too bad we voted to nationalize the Chicago Way. I also pointed out that when you attacked employers, the ones who would be hit the most and the hardest would be EMPLOYEES. Many times large corporations will even lobby for more regulations for their own industry because they know that they can handle all of the rules and paperwork far easier than their smaller competitors can. After all, a large corporation with an accounting department can easily handle filling out a few thousand more forms, but for a small business with only a handful of employees that kind of paperwork is a major logistical nightmare. When it comes to hiring new employees, the federal government has made the process so complicated and so expensive for small businesses that it is hardly worth it anymore. Things have gotten so bad that more small businesses than ever are only hiring part-time workers or independent contractors. So what we actually have now is a situation where small businesses have lots of incentives not to hire more workers, and if they really do need some extra help the rules make it much more profitable to do whatever you can to keep from bringing people on as full-time employees. And who do all these rules and regulations hurt the most but the very people Democrats cynically and deceitfully claim they are trying to help? Meanwhile, who does it help the most but the crony capitalist corporations who DON’T do most of the hiring in America who can profit from Obama’s war on business that results in the destruction of their small business competition. In the latest sign that the economic recovery may have lost whatever modest oomph it had, more small businesses say that they are planning to shrink their payrolls than say they want to expand them. That is according to a new report released Tuesday by the National Federation of Independent Business, a trade group that regularly surveys its membership of small businesses across America. The federation’s report for May showed the worst hiring prospects in eight months. The finding provides a glimpse into the pessimism of the nation’s small firms as they put together their budgets for the coming season, and depicts a more gloomy outlook than other recent (if equally lackluster) economic indicators because this one is forward-looking. While big companies are buoyed by record profits, many small businesses, which employ half of the country’s private sector workers, are still struggling to break even. And if the nation’s small companies plan to further delay hiring — or, worse, return to laying off workers, as they now hint they might — there is little hope that the nation’s 14 million idle workers will find gainful employment soon. “Never in the 37-year history of our company have we seen anything at all like this,” said Frank W. Goodnight, president of Diversified Graphics, a publishing company in Salisbury, N.C. He says there is “no chance” he will hire more workers in the months ahead. “We’re being squeezed on all sides,” he says. So let me ask again the question that the Los Angeles Times phrased: “Why are the wealthy benefitting from the ‘recovery’ as workers struggle? And the answer is simple: because Barack Obama and the Democrat Party are socialist who have destroyed the engine that creates the jobs that workers depend upon to flourish. An interesting fact is that businesses are now forced to spend $1.7 TRILLION a year in regulatory compliance costs. That is a massive hidden tax on their viability; it exceeds the overt income taxes businesses have to pay, and it most certainly exceeds their profits. And right now Obama is attacking them via the Dodd-Frank regulatory legislation, via the EPA, via OSHA, via ObamaCare and via the ridiculous actions of the NLRB in addition to their tax burden. Just to name a few. The result is businesses terrified to expand and further place their necks under Obama’s axe blade. Meanwhile, Obama’s socialist policies have not only devastated the worker by destroying his jobs, but they’ve ruined America on numerous other levels, too. Take the housing crisis – which was THE cause of the economic implosion of 2008. Did Obama make it better? Well, here’s a headline for you from CNBC: “US Housing Crisis Is Now Worse Than Great Depression.” Which is to say that Democrats – who first created the housing crisis by refusing to allow the regulation of their pet socialist wealth redistribution agencies Fannie Mae and Freddie Mac – took something awful and turned it into an American Dream-massacring nightmare. The latest job figures simply further document my point: Obama is destroying America job by job. Not only did the unemployment rate go up to 9.2% (Obama promised the American people that the unemployment rate would be 7.1% by now if he got his massive government-spending stimulus); not only were the previous two month figures adjusted DOWNWARD by some 45,000 jobs; not only have a third of the unemployed been unemployed for at least a YEAR with fully half of the unemployed having been unemployed for over six months (which is unprecedented); not only did the economy create an incredibly dismal 18,000 jobs (versus the 100,000 the economists naively expected); but a quarter million more people simply walked away from the workforce entirely – abandoning any hope that Obama will do anything more than crush their hopes of finding a job.